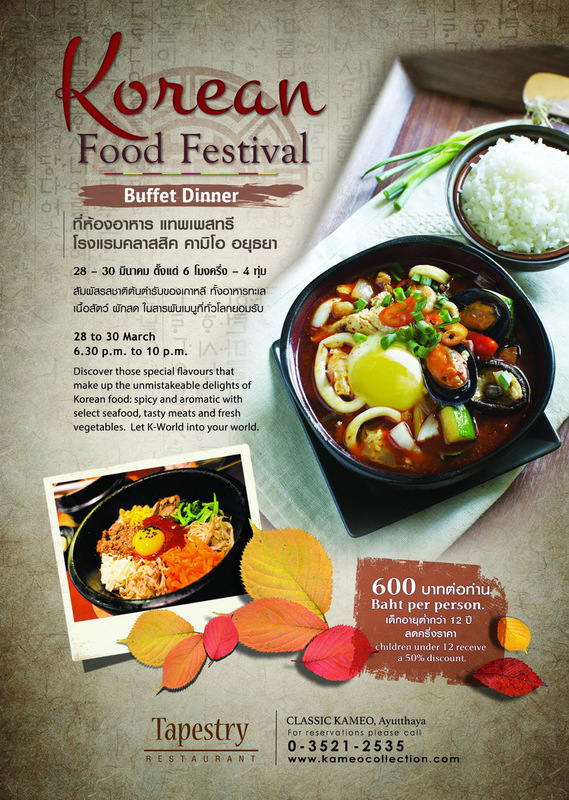 On 28 – 30 March 2017 from 6.30 p.m. to 10 p.m., at Tapestry Restaurant, Classic Kameo Hotel, Ayutthaya we will present our Korean Food Festival. Discover these special flavours that make up the unmistakeable delights of Korean food, spicy and aromatic with selected seafood, tasty meats and fresh vegetables. All prepared with typical Korean flair in our nightly buffet dinner, they bring K-World into the real world. This tempting culinary experience is 600 Baht net per person. Children under 12 receive a 50% discount. วันที่ 22 มีนาคม 2560 เวลา 16:03 น.